Virgin Orbit executives hope to conduct “significant” satellite launch operations out of Guam, but it’s too soon to say when that would start because there is still a lengthy regulatory process ahead and no final agreement has been signed. “We did a worldwide study of candidate airfields,” said Mandy Vaughn, an aeronautical engineer and president of Virgin Orbit’s sister company, VOX Space LLC. The conclusion was that Guam is “the best first place to go,” she said. "We’re excited about Guam because it makes for a great hub," said William Pomerantz, vice president of special projects. "You can get to a lot of places on missions from there." The three executives spoke to The Guam Daily Post on a conference call from Virgin Orbit’s headquarters in Long Beach, California. "We are a transportation company – a launch service for a new generation of smaller satellites," Pomerantz said. 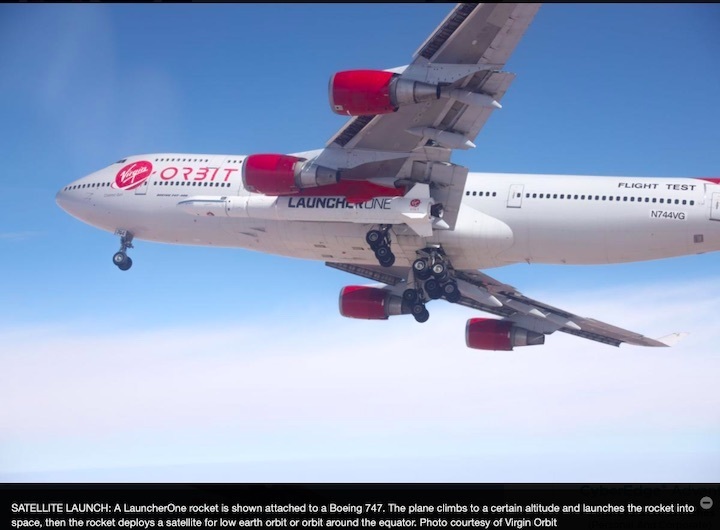 What Virgin Orbit plans to do is place a small satellite into its specially designed LauncherOne rocket and then attach the rocket to the underside of a Boeing 747’s wing. The industry is pivoting away from the extraordinarily expensive vertical rocket launches. 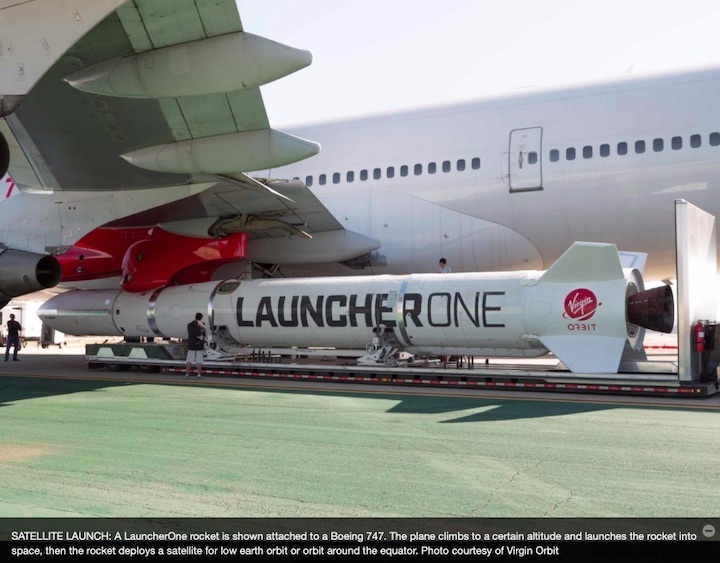 “For decades, people have wanted to make rockets operate with airline-like efficacy – lots of flights, quick turnaround time," Pomerantz said. That’s what Virgin Orbit plans to do, he added. “We’re not necessarily looking at having an aircraft based on Guam,” Vaughn said. “For the first few launches, or campaigns, we’d likely ship the rocket itself and the support equipment by boat over to Guam and probably fly the payloads in on another cargo aircraft,” she said. “We would come in with the aircraft for four to eight weeks, perform a series of launches and then relocate the aircraft back” to the continental U.S., Vaughn said. "That’s what we think will make the most sense for the first operations." The frequency of launches from Guam has yet to be determined, Pomerantz said. Pomerantz said global demand for small satellite launches “is roughly several times per month.” However, that doesn’t mean there would be two or more launches a month on Guam. “It’s too soon to say for sure ... what the launch demand from Guam would be,” Pomerantz said. “We’d probably go there and knock out several launches in rapid sequence, and then take the plane elsewhere and do launches that can’t conveniently be done on Guam." DalBello said Virgin Orbit is in “active dialogue” with the A.B. Won Pat Guam International Airport Authority about using the Guam airport to launch its commercial satellites into space. “We’re very interested,” DalBello said, “and we’re moving as quickly as we can.” However, he declined to estimate when the first launch might take place. “We have to comply with a very well-defined set of (Federal Aviation Administration) regulations. Everything will need to be licensed (by the FAA) for spaceflight, and that is long and involved,” DalBello said. Chuck Ada, former GIAA executive manager, told the Post in December 2018 that the airport "has been engaged in talks" with representatives of Virgin Orbit since March 2018. However, before any agreement with the company can be signed, Ada said, FAA needs to approve a commercial spaceport license for GIAA. Ada said the spaceport license application probably won’t be submitted to the FAA until March, and the approval process could take another six months. Only after that could an agreement be signed with Virgin Orbit.